Alighten Skincare is an all natural skincare line that contains many essential oils and botanical extracts. Elaine Becker, the founder, wanted a more natural solution than what was available to her. So she created Alighten. They are committed to being gentle on the environment by using glass bottles which can be infinitely recycled and retail boxes and shipping packaging made from recycled materials. They never test their products on animals or have ingredients that are tested on animals. They create a positive social impact on their community by donating a portion of their sales to companies that work with charities that give back by donating to those that give back by empowering communities, children and families to become free from hunger. 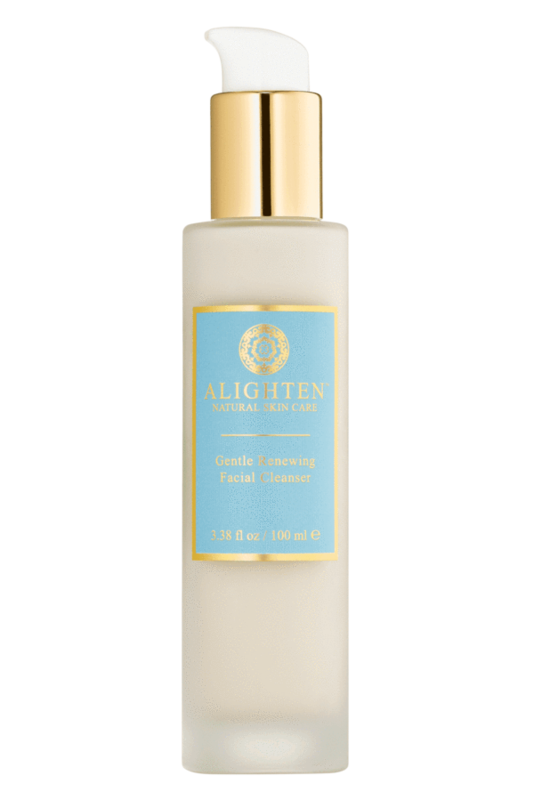 This luxurious, very gentle facial cleanser removes dirt, impurities and makeup with no dryness. Capuacu butter, Argan oil, and Beet Sugar extract create a smooth and moisturized feeling. Calendula extract and Aloe Vera soothe and calm the skin, all while a gentle infusion of Bilberry and Sugarcane extract along with Pumpkin Enzymes provide skin with an exfoliated and renewed, healthy looking glow. It is subtly scented with natural, non-sensitizing neroli, sandalwood, rosewood, rose geranium, and tangerine essential oils for a uniquely calming, yet gently uplifting experience. Personally, I find this cleanser decadent. It is the cleanser from a company that wants you to have fine skincare for skin that is all natural yet does not sacrifice anything. This is one of those products. It thoroughly cleanses the skin yet leaves it feeling soft and supple. I would recommend it for mature, dry, normal and combination skin types. It is very rich but would not cause acne. And it smells divine! Alighten's luxe, multi-tasking, ultra-light, concentrated serum addresses multiple anti-aging concerns for radiant, healthy-looking skin. It has Agave Stem Cells and Natural Peptides to help skin appear revitalized and to help fine lines appear softened, all while Gotu Kola, Date Palm, Goji Berry and Ginseng extracts energize skin and help it appear toned. Hyaluronic Acid hydrates skin for a plumped and youthful appearance. Calendula, Cucumber, and Aloe Vera calm and soothe delicate skin. Licorice and Mushroom extracts help brighten and renew. A unique nutrient rich complex of Watermelon, Spinach, Pumpkin, and Rose Hip Seed oils along with Biocompatible Olive Squalane provide a host of antioxidant benefits to help clarify and soften the skin. It is subtly scented with natural, non-sensitizing Neroli, Sandalwood, Rosewood, Rose Geranium, and Tangerine essential oils for a uniquely calming, yet utterly gently uplifting sensory experience. Feel a renewed glow with this indulgent treatment. Massage this luxe, anti-aging serum into skin morning and night after cleansing. Follow with moisturizer or SPF. Suitable for all skin types from dry to oily. 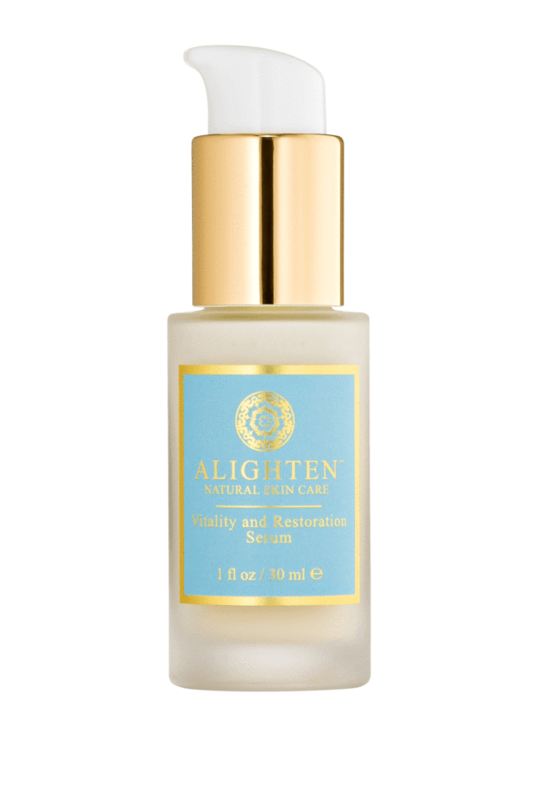 Tip: We at Alighten love layering this luxurious Vitality and Restoration Serum at night with our Nutritive Revitalizing Facial Oil. Apply serum first, then layer with Nutritive Revitalizing Facial Oil. The two formulas work in synergy to create the ultimate natural age minimizing experience for smooth, healthy, toned and hydrated feeling skin. This serum truly makes your skin feel alive, smooth, special and wonderful. Skin feels amazing after using this. The essentials oils and actives in this product go right into the skin and penetrate it so that it makes skin feel glowing and just super. Once you use this you will see how beautiful your skin can be. This facial oil is like nutrition for glowing, beautiful skin. It is a luxurious and fast-absorbing facial oil that is moisturizing without feeling heavy. Formulated with a unique antioxidant rich complex of Watermelon, Pumpkin, Spinach, Blueberry and Rose Hip Seed Oils to help gently clarify and revitalize skin's appearance and infuse skin with vitamins, flavonoids, and essential fatty acids. Argan and biocompatible Olive Squalane nourish, moisturize and enhance the appearance of skin's elasticity and tone. Calendula extract soothes and calm's sensitive skin. Skin feels healthy, plumped, and hydrated. Fine lines appear softened and skin has a beautiful, radiant glow. This facial oil is infused with natural, non-sensitizing Neroli, Sandalwood, Rosewood, Rose Geranium, and Tangerine essential oils for a subtle, deeply calming, yet gently uplifting experience. This facial oil just sinks into the skin, leaving no greasy feeling on the skin at all. Just soft, beautiful skin that is glowing and radiant. It is amazingly beautiful. Apply facial oil before bed and after cleansing skin for moisturized, radiant looking skin in the morning. For day use, pat a small amount on skin before applying makeup, for a hydrated, glowing appearance. Suitable for all skin types. 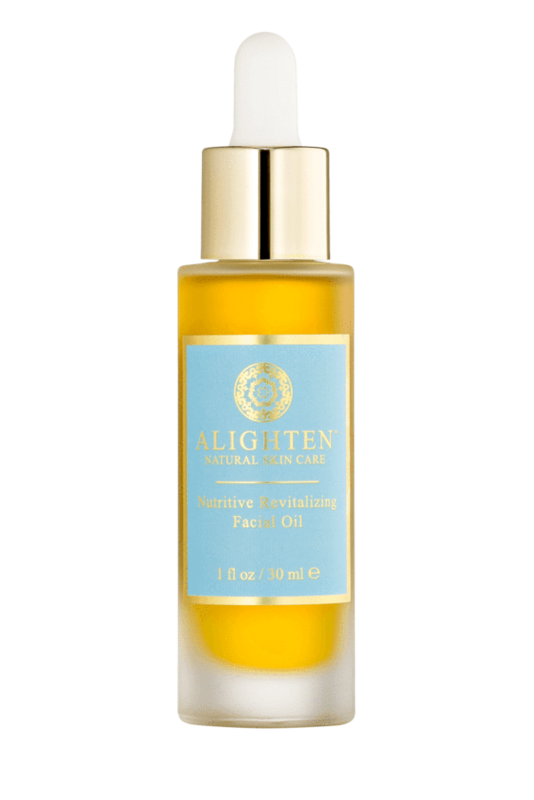 Tip: At Alighten, we love layering this gorgeous facial oil at night with our Vitality and Restoration Serum. Apply serum, then layer with Nutritive Revitalizing Facial Oil. The two formulas work in synergy to create an ultra smooth and hydrated feeling on the skin. Alighten Skincare can be found online at www.alightenskincare.com. Like Alighten on Facebook: https://m.facebook.com/Alightenskincare/; Follow Alighten on Twitter:@alightenskincar; Follow Alighten on Pinterest:https://www.pinterest.com/alightenskincar and Follow Alighten on Instagram:https://www.instagram.com/alightenskincare/.